When the Canadian government talks about trade diversification, the agreement it puts in the window is its trade deal with the EU, which took hold one year ago this week. But cutting tariffs is only the first step: if businesses don't take advantage, hopes for meaningful economic growth could be dashed. When the Canadian government talks about trade diversification, the agreement it puts in the window is its wide-ranging trade deal with the European Union, which started to take hold one year ago this week. But cutting a wide variety of tariffs — the way the Comprehensive Economic and Trade Agreement did — is only the beginning. If businesses don't take advantage of it, hopes for meaningful economic growth may be dashed. Early data suggest European businesses may have been faster to capitalize on CETA than Canadian ones. 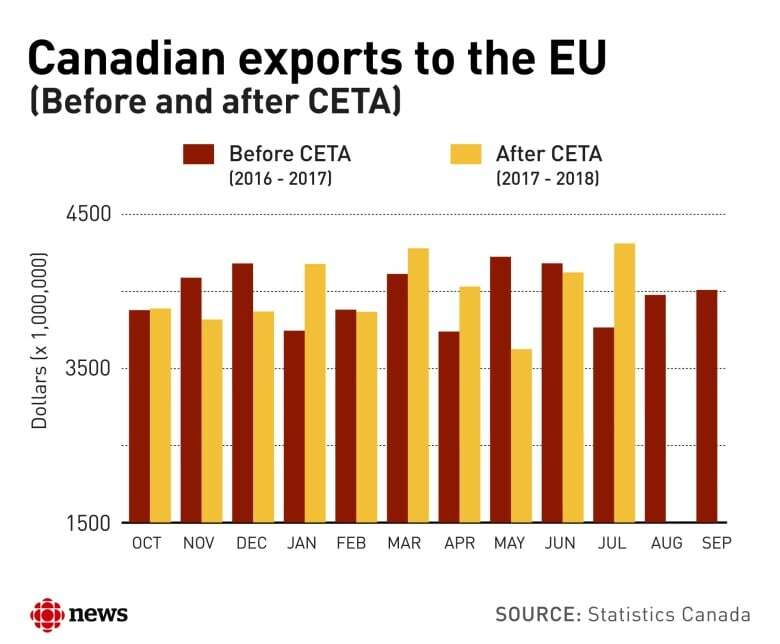 The relative success of CETA could be measured in many ways, but let's zero in on a big one: the growth of Canadian exports to the European Union. A scan of the monthly Statistics Canada data for the years immediately leading up to CETA's provisional application shows modest growth even before the deal's tariff reductions took effect on Sept. 21, 2017. But when comparing monthly data for Oct. 2017-July 2018 (the most recent available) with data from the same months the year before CETA, there are periods when Canada actually exported less than it did before the deal. Add those ten months of data together, and the overall growth compared to the same ten months from the year previous is less than one per cent. The growth in imports from the European Union, on the other hand, has been strong: over 12 per cent over the same time period. Looking at the monthly data, EU imports are up consistently since CETA's benefits began. It may be too early to draw firm conclusions. Monthly imports and exports calculated on a balance of payments basis, as these are, may be sensitive to changes in currency exchange rates. Import and export growth may also be influenced by the relative strength of an economy. Canada's biggest market in the EU remains the United Kingdom, an economy suffering from business uncertainty, thanks to its pending departure from Europe's common market — which also affects the future terms for Canada's trade. On the other hand, the EU country that exports the most to Canada is Germany. Its economy has outperformed the rest of Europe. CBC News asked Global Affairs Canada for evidence of CETA's economic impact to date. It calculated import and export growth on a different basis, but still came up with a similar finding: merchandise exports are up 3.3 per cent, while imports are up 12.9 per cent for the Oct. 2017-July 2018 period, compared to the year before. Mark Agnew, the director of international policy for the Canadian Chamber of Commerce, has been comparing the rate of trade growth under CETA to Canada's global import and export growth. "What stood out the most is that the rate of European import growth in Canada exceeded global import growth," he said, pinpointing how Europe may be now outperforming its competitors. "On the flip side, the growth of Canadian exports [under CETA] lagged behind the global growth in Canadian exports," he added. Which suggests Canada has more work to do. A rise in European imports isn't necessarily a bad thing. Consumers may enjoy more choice, or lower prices, now that tariffs have been cut. And Canadian businesses that use European suppliers may be more competitive. How can Canada improve its trading relationship with Europe? Tariffs are only one of the things that discourage trade. Many non-tariff barriers to Canada–EU trade, like rules and regulations that don't match, remain in place. 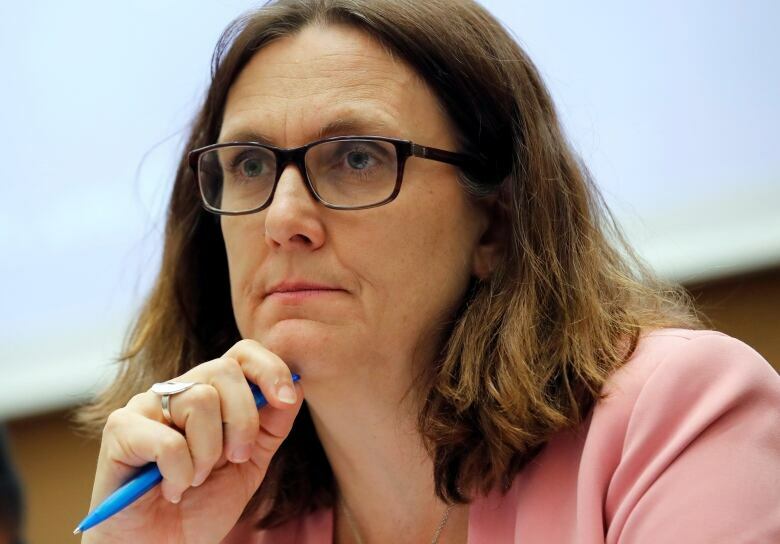 International Trade Diversification Minister Jim Carr will host European Trade Commissioner Cecilia Malmstrom in Montreal Sept. 26-27 for the first joint committee meeting on CETA's implementation. Of the 19 sub-committees Canada struck to deal with everything from motor vehicle regulations to professional qualifications to geographic indicators for agricultural products, six don't appear to have met yet, according to reports posted on the Global Affairs website. Some of Canada's priority exports, like beef and pork, have been stalled by ongoing scientific reviews, as the two sides struggle to recognize each other's food safety rules. "Trade promotion work is a tough slog," Agnew said. "It's not something that's quick and easy." Then there's the issue dominating Canada's trade agenda right now: our relationship with the United States, which still buys about three-quarters of Canada's exports. "If you talk to our members, it's NAFTA that's taking up all the oxygen," Agnew said. While the government may hope to diversify its suite of trading partners, "it takes a bit longer to move that ship around for Canadian businesses," he said. The European ratification process to finalize the full deal is still underway, with some countries, like Italy, still voicing concerns. Some Canadian businesses might hesitate to make a major European gambit as a result. "It comes down to the Canadian mentality," said Jason Langrish, the executive director of the Canada Europe Roundtable for Business, an organization that has pushed for this deal from the beginning. Canada talks a lot about diversification, but only a small number of Canadian businesses are truly global operators. By contrast, the Europeans are "hunters" when it comes to finding new markets. "They look for it," he said. "We remain a fairly parochial place in the business world," he said. "Policy makers have been wringing their hands for years." All the "cry wolf" moments and delays CETA faced along its decade-long negotiation and ratification process haven't helped, Langrish said. 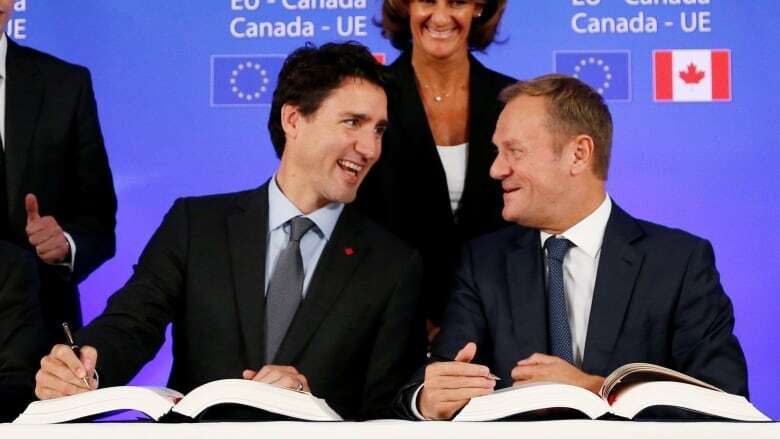 "People held off on decisions because it was announced falsely so many times," he said, referring to several announcements and signing ceremonies under the previous Conservative government that heralded CETA's completion before it was really in place. Data provided by Global Affairs touted several hopeful signs for Canada. 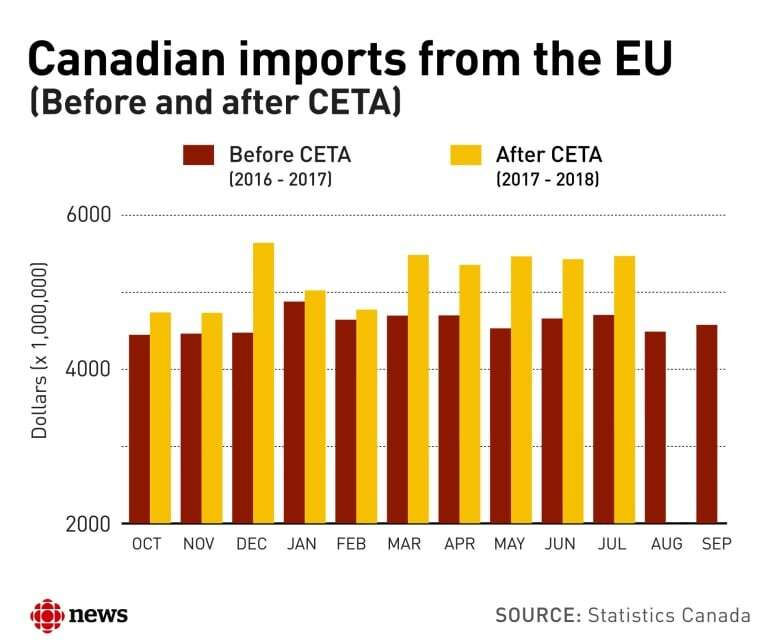 One of CETA's goals was to penetrate new European markets beyond Canada's traditional trading relationship with the U.K. Canadian exports to other EU countries were up 6.9 per cent overall, compared to just 3.3 per cent when exports to Britain were factored in. Aluminum, showing export growth of 206 per cent over this time period, driven by a huge jump in non-alloyed unwrought aluminum shipments. Canadian aluminum used to face a tariff of three per cent in the EU, and now enters tariff-free. Motor vehicles and parts, up 96 per cent, driven by increases in passenger vehicle imports. The EU's car tariffs phase out slowly between now and 2024, but have already been cut from 10 pre-CETA to 7.5 per cent in 2018. Exports of inorganic chemicals, mineral fuels and oil (including crude oil) and pharmaceuticals are also up. It's unclear how much of this growth is attributable to CETA because these tariff rates were already at zero. Export growth in cranberries and maple syrup — two agricultural products that used to face significant tariffs but are now tariff-free — was also strong, according to Global Affairs.